Subject: Decentralization of Central Pension Accounting Office. I am directed to invite your kind kind attention towards demand No. 17 of Charter of Demands submitted vide letter No. AICAEA/HQ/A-2/2015/519 dated 02.06.2015 on the subject cited above and to state that proposal has been examined by the CPAO and they have not recommended the decentralization of CPAO on the grounds that Electronic Government National Plan Scheme has been fully implemented in the CPAO. As such, it is not administratively feasible to decentralization the CPAO. 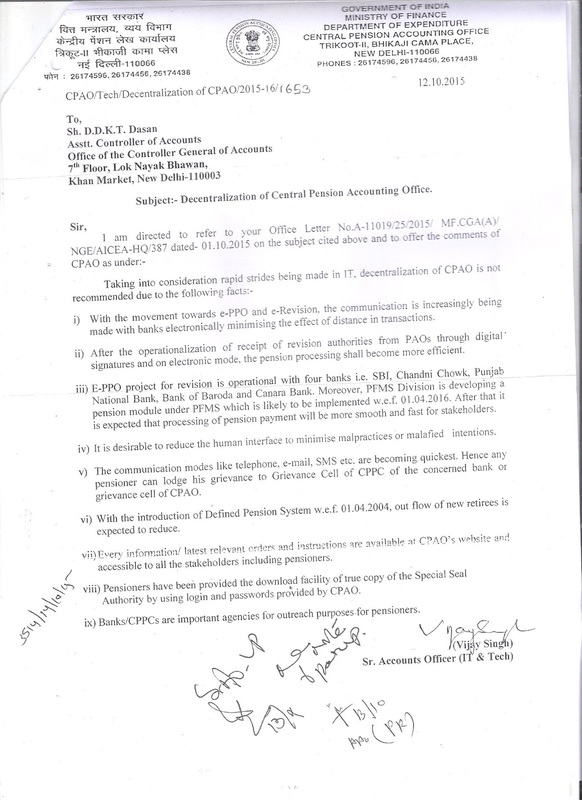 A copy of CPAO’s letter No.CPAO/Tech/Decentralization of CPAO/2015-16/1653 dated 12.10.2015 is forwarded herewith for your kind information. 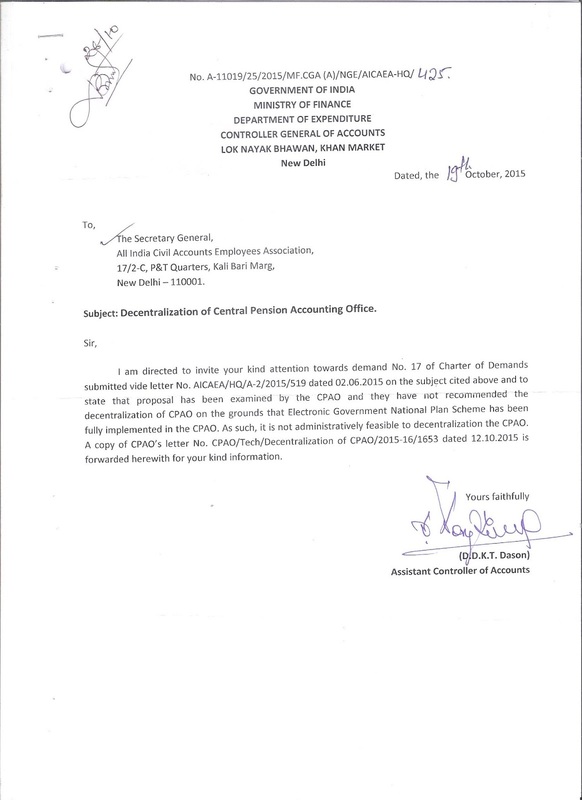 Subject:- Decentralization of Central Pension Accounting Office. i) With the movement towards e-PPO and e-Revision. the communication is increasingly being made with banks electronically minimising the effect of distance in transactions. ii) After the operationalization of receipt of revision authorities from PAOs through digital signatures and on electronic mode. the pension processing shall become more efficient. iii) E-PPO project for revision is Operational with four banks i.e. SBI, Chandni Chowk, Punjab National Bank, Bank of Baroda and Canara Bank. Moreover, PFMS Division is developing a pension module under PFMS which is likely to be implemented w.e.f. 01.04.2016. After that it is expected that processing of pension payment will be more smooth and fast for stakeholders. iv) It is desirable to reduce the human interface to minimise malpractices or malafied intentions. v) The communication modes like telephone. e-mail, SMS etc. are becoming quickest. Hence any pensioner can lodge his grievance to Grievance Cell of CPPC of the concerned bank or grievance cell of CPAO. vi) With the introduction of Defined Pension System w.e.f. 01 04.2004, out flow of new retirees is expected to reduce. accessible to all the stakeholders including pensioners. viii) Pensioners have been provided the download facility of true copy of the Special Seal Authority by using login and passwords provided by CPAO. ix) Banks/CPPCs are important agencies for outreach purposes-for pensioners.